Prominent & Leading Manufacturer from Faridabad, we offer paper bag making machine. 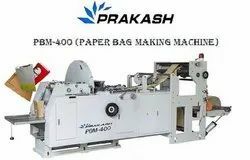 A revoluntionary PBM 400 whic is mastered to produce finest paper bag with high performance speed. Get the bags ready at the minimum cost. Great finishing equiped by Servo motor and glue motor. Rugged structure ensures better quality and life of machine.